For the publishing company, see Casemate Publishers. A casemate is a fortified gun emplacement or armored structure from which guns are fired. Originally, the term referred to a vaulted chamber in a fortress. In armoured fighting vehicles that do not have a turret for the main gun, the structure that accommodates the gun is termed the casemate. The word comes from the Italian casamatta, the etymology of which is uncertain, though it could derive from casa (in the sense of "hut"), and matta (Latin matta), "done with reeds and wickers", thus a low-roof hut without windows or other openings set in marshy place. It could also derive from casa matta with matta in the sense of "false". A casemate was originally a vaulted chamber usually constructed underneath the rampart. It was intended to be impenetrable and could be used for sheltering troops or stores. With the addition of an embrasure through the scarp face of the rampart, it could be used as a protected gun position. In the early 19th century, French military engineer Baron Haxo designed a free-standing casemate that could be built on the top of the rampart. Casemates built in concrete were used in the Second World War to protect coastal artillery from air attack. In warship design the term "casemate" has been used in a number of ways. The American Civil War saw the use of casemate ironclads: armored steamboats with a very low freeboard and their guns on the main deck ('Casemate deck') protected by a sloped armoured casemate, which sat on top of the hull. Although both sides of the Civil War used casemate ironclads, the ship is mostly associated with the southern Confederacy, as the north also employed turreted monitors, which the south was unable to produce. The most famous naval battle of the war was the duel at Hampton Roads between the Union turretted ironclad USS Monitor and the Confederate casemate ironclad CSS Virginia (built from the scuttled remains of the Merrimack). "Casemate ship" was an alternative term for "central battery ship" (UK) or "center battery ship" (US). The casemate (or central battery) was an armoured box that extended the full width of the ship protecting many guns. The armoured sides of the box were the sides of hull of the ship. There was an armoured bulkhead at the front and rear of the casemate, and a thick deck protecting the top. The lower edge of the casemate sat on top of ship's belt armour. Some ships, such as the Alexandra (laid down 1873), had a two-storey casemate. Casemates on the Haruna, showing their vulnerability to flooding. A "casemate" was an armoured room in the side of a warship, from which a gun would fire. A typical casemate held a 6-in gun, and had a 6" front plate (forming part of the side of the ship), with thinner armour plates on the sides and rear, with a protected top and floor, and weighed about 20 tons (not including the gun and mounting). Casemates were similar in size to turrets; ships carrying them had them in pairs, one on each side of the ship. The first battleships to carry them were the British Royal Sovereign class laid down in 1889. They were adopted as a result of live-firing trials against HMS Resistance in 1888. Casemates were adopted because it was thought that the fixed armour plate at the front would provide better protection than a turret, and because a turret mounting would require external power and could therefore be put out of action if power were lost – unlike a casemate gun, which could be worked by hand. The use of casemates enabled the 6-in guns to be dispersed, so that a single hit would not knock out all of them. Casemates were also used in protected and armoured cruisers, starting with the 1889 Edgar class. and retrofitted to the 1888 Blake class during construction. 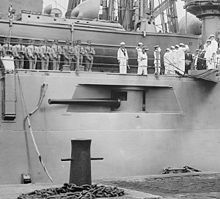 In the pre-dreadnought generation of warships, casemates were placed initially on the main deck, and later on the upper deck as well. Casemates on the main deck were very close to the waterline. In the Edgar-class cruisers, the guns in the casemates were only 10 feet (3.0 m) above the waterline. Casemates that were too close to the waterline or too close to the bow (such as in the 1912 Iron Duke-class dreadnoughts) were prone to flooding, making the guns ineffective. Shipboard casemate guns were partially rendered obsolete by the arrival of “all-big gun” battleship, pioneered by HMS ‘’Dreadnought’’ in 1906, but were reintroduced as the increasing torpedo threat from destroyers forced an increase in secondary armament calibre. Many battleships had their casemates plated over during modernization in the 1930s (or after Pearl Harbor, in the case of US vessels) but some, like HMS Warspite carried them to the end of WWII. The last ships built with casemates as new construction were the American Omaha class cruisers of the early 1920s and the 1933 Swedish aircraft cruiser Gotland. In both cases the casemates were built into the forward angles of the forward superstructure (and the after superstructure as well, in the Omahas). A Jagdtiger, an example of a casemate armoured vehicle. The Swedish Strv 103 was used until the 1990s. In regards to armoured fighting vehicles, casemate design refers to vehicles that have their main gun mounted directly within the hull and lack the rotating turret commonly associated with tanks. Such a design generally makes the vehicle mechanically simpler in design, less costly in construction, lighter in weight and lower in profile. The saved weight can be used to mount a heavier, more powerful gun or alternatively increase the vehicle's armour protection in comparison to regular, turreted tanks. However, in combat the crew has to rotate the entire vehicle if an enemy target presents itself outside of the vehicle's limited gun traverse arc. This can prove very disadvantageous in combat situations. During World War II, casemate-type armoured fighting vehicles were heavily used by both the German Wehrmacht and the Soviet Red Army. They were mainly employed as tank destroyers and assault guns. Tank destroyers, intended to operate mostly from defensive ambush operations, did not need a rotating turret as much as offensively used tanks, while assault guns were mainly used against fortified infantry positions and could afford a longer reaction time if a target presented itself outside the vehicle's gun traverse arc. Thus, the weight and complexity of a turret was thought to be unnecessary, and could be saved in favour of more capable guns and armour. In many cases, casemate vehicles would be used as both tank destroyers or assault guns, depending on the tactical situation. The Wehrmacht employed several casemate tank destroyers, initially with the still-Panzerjäger designation Elefant with an added, fully enclosed five-sided (including its armoured roof) casemate atop the hull, with later casemate-style tank destroyers bearing the Jagdpanzer (literally 'hunting tank') designation, with much more integration of the casemate's armour with the tank hull itself. Examples are the Jagdpanzer IV, the Jagdtiger and the Jagdpanther (the latter two translate as 'Hunting Tiger' and 'Hunting Panther', respectively). Assault guns were designated as 'Sturmgeschütz', like the Sturmgeschütz III and Sturmgeschütz IV. In the Red Army, casemate tank destroyers and self-propelled guns bore an "SU-" or "ISU-" prefix, with the "SU-" prefix an abbreviation for Samokhodnaya Ustanovka, or "self-propelled gun". Examples are the SU-100 or the ISU-152. Both Germany and the Soviet Union mainly built casemate AFVs by using the chassis of already existing turreted tanks, instead of designing them from scratch. While casemate AFVs played a very important role in World War II (the Sturmgeschütz III for example was the most numerous armored fighting vehicle of the German Army during the entire war), they became much less common in the post-war period. Heavy casemate tank destroyer designs such as the US T28 and the British Tortoise never went beyond prototype status, while casemate vehicles of a more regular weight, such as the Soviet SU-122-54, saw only very limited service. The general decline of casemate vehicles can be seen in the technological progress which resulted in the rise of universal main battle tanks, which unified in them the capability to take up the roles and tasks which in the past had to be diverted between several different classes of vehicles. However, vehicles such as the German Kanonenjagdpanzer of the 1960s still let the casemate concept live on, while the Swedish Army went as far as employing a casemate tank design, the Stridsvagn 103, or 'S-Tank', as their main armoured fighting vehicle from the 1960s until the 1990s, favoring it over contemporary turreted designs. Other casemate design ideas, such as the projected German Versuchsträger 1–2 with two main guns, were developed even later. This well-preserved German casemate at Fort Hommet on the Island of Guernsey is rare in that it retains its original gun. The Londres Battery of the Fortress of Humaitá, which guarded the entrance to Paraguay. Wikimedia Commons has media related to Casemates. ^ Battisti, Carlo; Alessio, Giovanni (1950–57). Dizionario etimologico italiano [Italian Etymological Dictionary] (in Italian). 1. Florence: Barbera. pp. 788–89. ^ Devoto, Giacomo (1979). Avviamento all'etimologia italiana [An Introduction to Italian Etymology] (in Italian). Milan: Mondadori. p. 69. ^ a b Hovgaard, William, Modern History of Warships, pp. 14–15. ^ Hovgaard, William, Modern History of Warships, p. 18. ^ Hovgaard, William, Modern History of Warships, pp. 78–79. ^ a b c d Brown, David K, Warrior to Dreadnought, p. 129. ^ Brown, David K, Warrior to Dreadnought, pp. 101–02, 129. ^ a b Brown, David K, Warrior to Dreadnought, pp. 134–35. ^ Brown, David K, Warrior to Dreadnought, p. 136. ^ Brown, David K, The Grand Fleet, Warship Design and Developments 1906–1922, p. 42. ^ Robert Bud; Philip Gummett; Science Museum (Great Britain) (1 January 1999). Cold War, Hot Science: Applied Research in Britain's Defence Laboratories, 1945–1990. Harwood Academic Publishers. p. 182. ISBN 978-90-5702-481-8. ^ Michael Green; James D. Brown (15 February 2008). Tiger Tanks at War. MBI Publishing Company. pp. 90–91. ISBN 978-1-61060-031-6.